When you go camping, along with your cookware and camping stove, don't forget to bring the crank camping lanterns. These lanterns are becoming more and more popular for camping trips. One of the ideal things about a crank lantern is that it doesn't need batteries. All you have to do is use a little of your own energy to turn a handle located on either the side of the lantern or the bottom of the lantern. Cranking the handle generates the power to light the lantern. On the market today, there are a variety of crank camping lanterns. These sturdy and easy-to-manage items can be purchased online, or at stores like JC Penney and Sears. The North 49-LED Crank Lantern has a variety of special features that make it unique. Its 12 LED bulbs last up to 80,000 hours. To turn it off and on, all you need to do is push a switch. There are four illumination modes -- 1) OFF 2) 4 LED 3) 8 LED and 4) 12 LED. A bright light is provided by a white LED. The device is cranked by a handle and the same handle is used for easy carrying. There is a hook also on the handle so the lantern can be hung. A nifty feature is a built-in compass. This lantern can be operated or charged with a AC 120 volt to 6 volt DC adapters. Due to its size of only 10.5 inches tall and five inches wide, the North 49-LED makes for a handy product. It sells for about $25.00.The Revolutionary Guide Gear 20-LED Crank Lantern is another popular crank lantern. Some of its features include a metal safety cage, a carry handle which can also serve as a hanging hook, an internal generator, and an auxiliary charging port. With a height of ten-and-a-half inches, and weighing only three pounds, this lantern is ideal to pack on a camping trip. Read more about this unique lantern at The Sportsman's Guide website. Would you like some music at your campsite? Perhaps a little country-western as you wait for the hamburgers and hot dogs to grill? Crank flashlights and crank camping lights with radios can provide some tunes for you. One such flashlight is The Kaito MS503 which runs between $15.00 and $40.00. This item is a combination of a 5-LED flashlight, a camping lantern, and an AM/FM radio. If cranked for a minute, it can last for ten minutes. It's made of durable plastic. 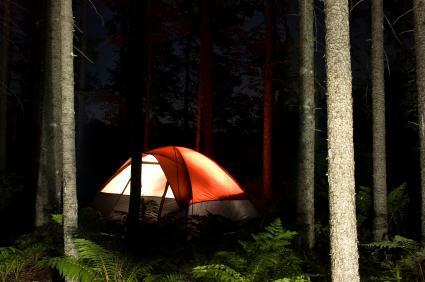 A camping site can stay well-lit with this device, and when the light starts to fade, a turn of the crank will provide you with another ten minutes of bright light. The Kaito KA404 is like the Kaito MS503 because it can also shine brightly for ten minutes after one crank. With a retail value of $25.00, this combination flashlight, lantern, and AM/FM radio, is ideal for many reasons. The item includes built-in speakers and a telescoping FM antenna so even in remote locations, you can pick up a radio station to your liking. An amazing versatile product for those who want everything in one compact portable container, is the Solar/Crank Flashlight, Radio and Siren. This product costs about $50.00 and as its name implies includes a lantern, flashlight, siren, and AM/FM radio. It can be recharged via a cigarette lighter adapter or by an AC adapter. Amazingly, it has a telescopic antenna. This product weighs a little over one pound, is 4.25 inches by 4.75 inches by 9.5 inches and can be carried in a plastic case. To convert the flashlight into a crank camping lantern, you can pull out the outer rim around the 3 LED bulb. The lantern stands on its own to brighten the surrounding area. Also, if you happen to have a medical need and/or want to alert others, the siren on this device serves the purpose for getting help. You can see that crank camping lanterns are ideal for many reasons. Although mainly used at camp sites, on walking trails, or in boats, having one in your house during a power outage, earthquake, or storm will prove to be handy. Keeping one in your vehicle could be beneficial during an emergency as well. As for batteries, you won't have to worry about having enough of them again!